We made it~ it was iffy there for a while. It was hot under the blanket. Scaredy-Cat-Pants aside, it was a beautiful day! We woke up early to swim before we checked out. We had the pool all to ourselves too- so that was nice. Chickadee wasn't having any of it- she chose to sleep instead. So this coming weekend- they all get to plant something pretty- or something that will produce food- and they will take care of it individually. We do a huge garden each year and they help a little, but this will get them excited (I hope). 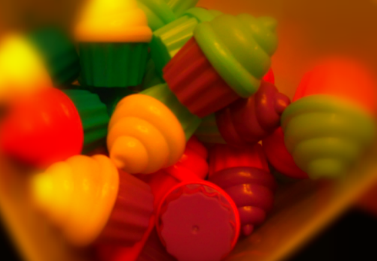 Look at those cute little cupcake "eggs"! The "teacher" in me snatched those babies away from them as soon as they were found! I'm not sure how- but I NEED to use those in my classroom! We took a break from festivities to cook. I saw these on Pinterest- and I wanted to make them. The one in the very front- looks really creepy! He's like a combo "bug eyed fly/chicken guy". Either way, they tasted yummy! (They moved too fast for me to get good pictures of that- but it was pretty funny). Oh, well, I hope he enjoyed his ugly, naked coffee!!!! And I hope all of you enjoyed your Easter weekend! I love your "cutie coffee"! Your coffee is def cute! I like the zombie egg friends! 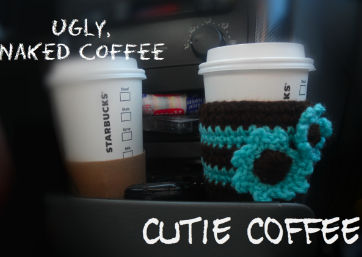 what do I have to do to get a coffee cozy cutie? I laughed at the creepy egg. My family wanted deviled eggs but I never did it. Now I feel extra terrible after seeing your amazing cracking shell eggs. I love that you gave the kids their gifts in planting pots!!!! So smart! And the cupcake eggs are ADORABLE! I love the zombie eggs- and I bet they were YUMMY. and I'm with Reagan- What do I have to do to get a cutie coffee coozy. I don't drink coffee, but you better bet your buns I'd use it to make my hot chocolate not ugly and naked!! And my fam plants a big garden every summer too- we should have a harvest party. Pick, snap, wash, jar, can. Repeat. It gets old doing it solo. When are you having that cutie coffee cozy giveaway?!? Huh? Huh? Remember I need the one with the 'stache and I plan on winning it! Love the plant pot idea, totally stealing it for next year - we always lose our baskets and I just can't stand spending $$ for something that's going to get thrown away!